Oven Cleaning Home & Commercial Kitchen Enfield EN | Quality Property Care Ltd.
Every housekeeper needs a modern and fast professional oven cleaning! Quality Property Care Ltd. offers it at a reasonable price and with no impact on your healthy lifestyle! Don't hesitate to get your home and office oven cleaning on 020 3746 4287 on every day of the week with no exception for holidays or weekends! All of the cleaning is performed with child and pet safe, organic cleaning solutions. Our detergents have antibacterial properties, keeping your kitchen fungal-free. We use special detergent for fridges with a long lasting effect but with no harmful consequences for the food or your health. We take apart any detachable parts and clean them individually, removing any dirt from them. The main body of the fridge is also cleaned thoroughly, removing any streaks, pieces of fruit and food from the racks. To remove unpleasant odours we use an odour neutralizing agent. All of the appliances are treated with suitable detergents, which are biodegradable and assure the safety of you and your family. Quality Property Care Ltd. was established in 2005, and has been cleaning the ovens of restaurants, people and different businesses ever since. The oven cleaners are very carefully picked, thoroughly trained and certified to work with many brands and types of ovens, cookers, range cookers and others. The oven cleaning services are fully insured, and the kitchen appliance or the oven is tested before and after the deep cleaning. A dip tank deluxe method is used to soak parts of the oven. The cleaners dismantle and soak and then use wire brushes and sponges to clean trays, pans, racks, panels, fans, light protectors, control knobs and extractor filters from all the grime and dirt, burnt on carbon and residual grease. Our professional oven cleaners have the ability to properly clean a wide range of stoves, ovens, hobs, ceramic cooktops, ceramic hobs, hotplates, gas hobs, gas grills, BBQ racks, microwaves, AGA cookers, Rayburn range cookers, Cookware, extractors, stanley range cookers, fridges, freezers, warm drawers and upon request all of your kitchen appliances. Proper cleaning for halogen and ceramic hobs, free-standing ovens, induction hobs and electric cookers. This cleaning services are for commercial and domestic clients. 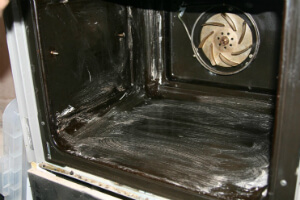 We use special brands of cleaning materials and detergents to maintain the function and appearance of your range ovens. We are familiar with brands like Rayburn range cookers, Rangemaster range cooker, Smeg Range Cooker, AGA range cooker, Alpha range cookers, Stanley range cooker. We can also perform tile and grout cleaning, ductwork cleaning and duct cleaning, structural cleaning, splash back cleaning, dishwasher cleaning, canopy filter cleaning and more. Free your oven from grime and bacteria! Make an order via the online booking form or give us a call today! Get a free quote and receive more information about oven cleaning services in Enfield EN now! Give us a call on 020 3746 4287 at the best time for you and we will arrange your effective and fast visit!